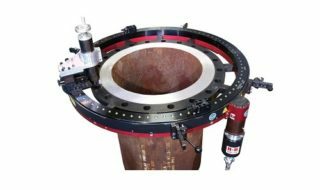 We offer a variety of powerful and innovative portable flange facers for 0 – 86 inch (0 – 2184.4 mm) diameters. The working range is 4 – 86 inches OD (101.6 – 2184.4 mm, depending on the model). These job-proven O.D. mount series of machines are easily converted into efficient, accurate flange reconditioning tools. The counter bore head attachment is mounted to a cross bar or directly to the tool slide to machine the gasket surface and/or bolt pattern. Depending upon the number of trippers used, record groove surface finishes from 63 to 500 RMS can be applied in minutes. 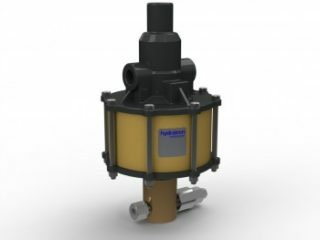 The 1.35 hp pneumatic motor, with optimized drive reduction, provides more power and speed resulting in higher metal removal rates. The auto-feed system, bearing guards, and E-stop keeps operators hands safe from rotating and moving parts as well as pinch points. The customized setup fingers and leveling feet allow the operator to easily setup up the machine, going from crate to cut in less than 15 minutes.